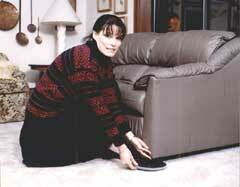 The ORIGINAL furniture movers for carpeted areas for the homeowner and the professional. Place a 4" or 8" Skidder under each leg of the furniture and slide it anywhere you need. Now you can move furniture on Hardwood, Tile, Ceramic or Vinyl floors. 4" Skidders now ONLY $19.99 * per set. 8" Skidders now ONLY $29.99 * per set. * Quantity pricing is also available. For information on quantity pricing or on becoming a distributor, call us Toll Free at 800-362-8380.